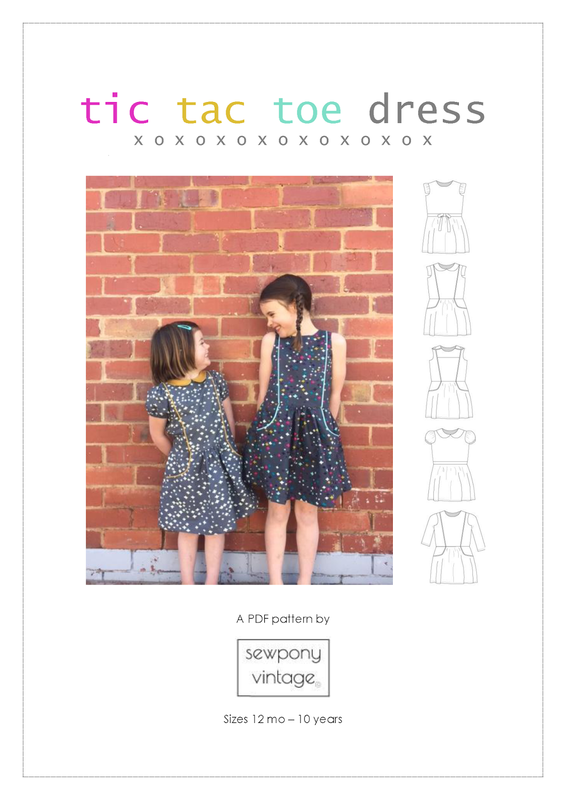 Today I am very happy to announce the release of my latest pattern, the tic tac toe dress!! You can receive 20% off the pattern for the next 48 hours with the code: TICTACTOE20. 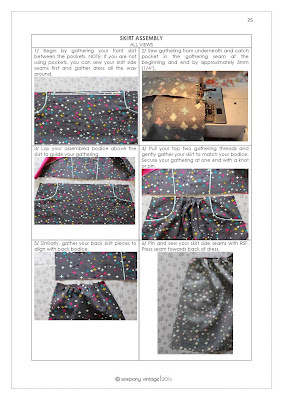 Enter the code at checkout in the sewponyvintage shop here! 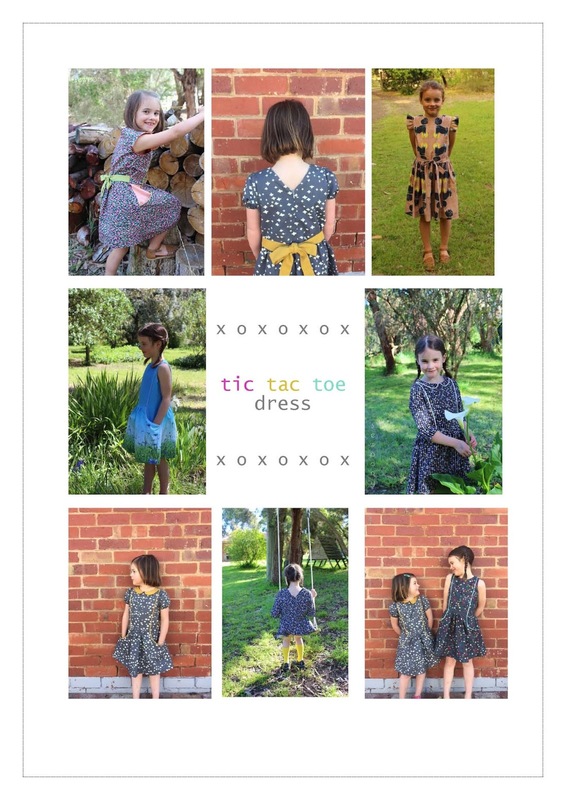 The tic tac toe dress is a vintage inspired, versatile and feminine dress pattern that offers many options to create your own unique look. 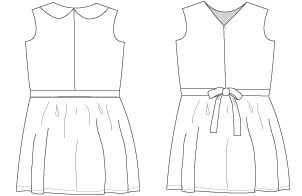 The dress features a separate bodice that can be pieced and piped or left plain. 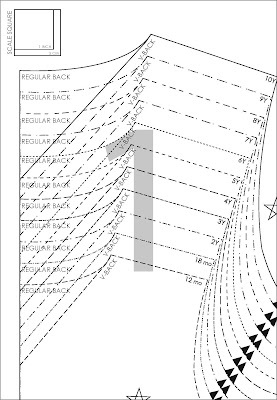 An optional half or full peter-pan collar or epaulettes with buttons can be added to the neckline. Sleeve options include: sleeveless, small rectangular sleeve, (larger) gathered rectangular sleeve, short puffed sleeve, three quarter or long sleeves – so the tic tac toe dress pattern can be used all year round, no matter where you live! The gathered skirt can be accented with piped pockets and paired with the pieced bodice to provide a striking front dress detail. For a simpler look, the skirt can be left plain. The dress can also be made with an optional tie that can be worn at the front or back. 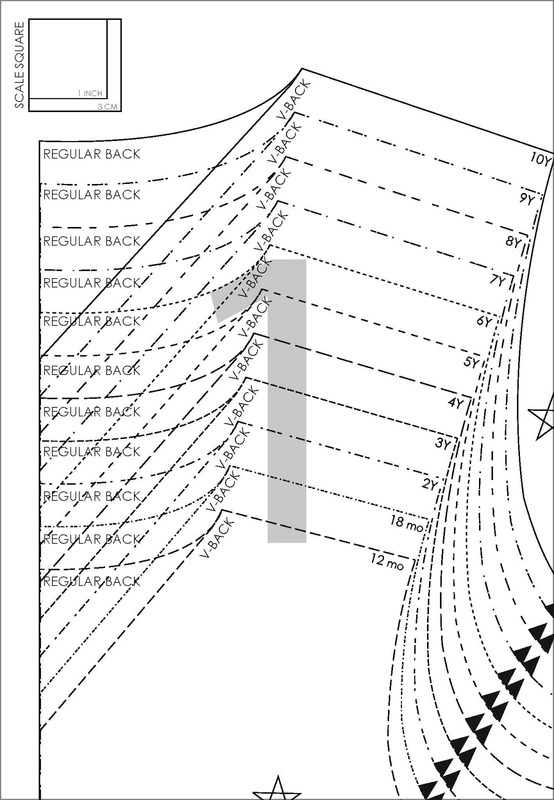 The back can be made with regular neckline or with V-neckline. Mix and match prints to create different looks. Do you need the measurement tables before you purchase? All the details are in the shop listing. A big thank you goes to my eighteen wonderful testers! Thank you An, Anke, Aukje, Carrie, Erin, Hanne, Jenya, Iris, Jess, Kate, Marisa, Miranda, Natalie, Renee, Suzanne, Thouraya, Trisha and Zoe. Thank you for all your beautiful sewing, thorough testing and proof reading. Many of these ladies will be joining the tic tac toe dress blog tour which begins in a week and half so you will see their beautiful dresses then. You may also see some sneak peeks on instagram by searching #tictactoedress. I can't wait to see lots of lovely tic tac toe dresses around the web!!! I hope you enjoy the pattern as much as I do!!! Congratulations Suz, such a beautiful dress with so many lovely variations. I would like to order this great patern and profit the discount. But I can only pay by credit card or paypall, which I don't have. Is there any other option to get it? Is it possible to pay throug bank transfer?